Clenet is arguably the most beautifully-styled automobile series ever built. Each limited-production model was conceived, designed, and produced by a small team of dedicated men and women in Santa Barbara County, California in the 1970s and 1980s. The automobile's distinctive 1930s styling and meticulous hand craftsmanship turned heads wherever they went. Clenets boasted the latest in drive train and suspension system technology under a body of steel giving them superior reliability to go with their beauty. Clenet Coachworks Inc. was formed by Alain Clenet and investors in 1975. Alfred J. DiMora was one of the early employees in 1976. The company ran into financial difficulties in the 1980s, ceased production, and filed for bankruptcy. DiMora purchased the assets of Clenet Coachworks Inc. and revived Clenet production at a new factory in Carpinteria, California. Features such as Italian walnut burl dashboards and etched glass accented by Waterford crystal ashtrays brought many Clenet models in at over $100,000. Buyers ranged from Farrah Fawcett, Rod Stewart, former World Boxing Champion Ken Norton, Superbowl Champion Quarterback Jim McMahon, and Sylvester Stallone to King Hassan II of Morocco. 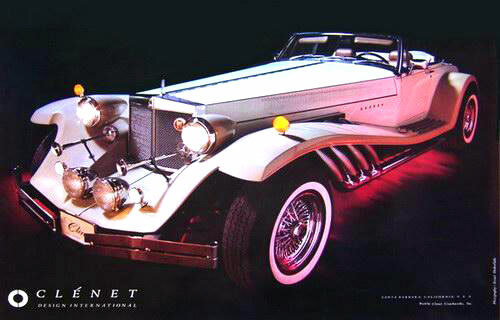 Clenets were called "Drive Art" by Automotive Age and the "American Rolls-Royce" by Fortune. DiMora's Clenet was selected as the Official Centennial Car in 1986, the year that President Reagan declared the Centennial Year of the Gasoline-Powered Automobile. As a result, DiMora and the automobile were honored at the Automotive Hall of Fame in Michigan. This section provides a history of this beautiful series of automobiles. It includes a sampling of those who bought and loved their cars, the rave notices of the news media, and the factories where these timeless classics sprang to life. 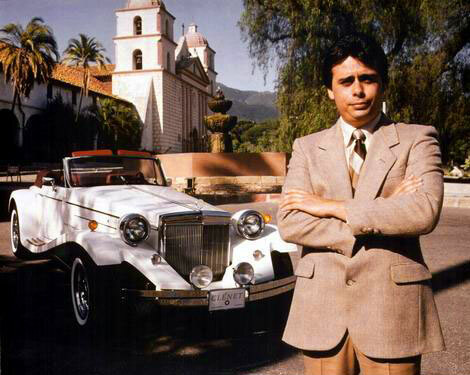 Alfred J. DiMora with the Clenet Series III Asha at the Santa Barbara Mission in California.